The best examples of the Scene Seen effect in domestic architecture include Mies van der Rohe's Farnsworth House (1948), Philip Johnson's Glass House (1949) and Pierre Koenig's Case Study House #22 (1960). Scene Seen creates a visual image that changes according to the location of the viewer although the design composition remains the same. When viewing from the outside of the building, the interior spaces and its users are highlighted and become visually accessible as if displayed in a vitrine. As in a vitrine, they are contained within a defined volume that from the exterior appears precious and contrasts against the vastness of the surroundings. In contrast, when viewing from the inside of the building, the exterior space becomes visually accessible and causes the building inhabitants to project on the exterior landscape. The inhabitants, although inside the building, appear to be on the outside. As a result, the interior space seems physically larger and uncontained. Scene Seen appeared in residences in the early-mid 20th century as a glass box. This composition showcased the house through its whole perimeter, causing interior spaces to become the façade of the building and exterior ones to be pictorialized into the residential space. 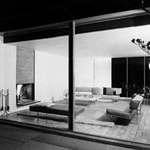 Examples of glass box houses are Mies van der Rohe's Farnsworth House (1948) and Phillip Johnson’s Glass House (1949). Mies conceived the Farnsworth House as a glass box elevated over the terrain and in explaining the way it is experienced stated that “nature is truly affecting only when it begins to be dwelled in”.7 Philip Johnson exemplified Mies’ statement by siting his Glass House directly over the terrain and camouflaging it with the outer scene. He used terracotta-colored materials for the floor and furniture to complement the greenery of the surroundings and project the residents to the outside in an immediate and seamless way. In the 1970s and 1980s, Scene Seen appeared as a large glass veil encompassing one or two sides of the house. In this type of residence, interior spaces constitute the most predominant sides of the building while the exterior becomes a mural wall. In this same time period, Scene Seen appeared in houses in which a single interior space, such as a studio, reposed behind a glass box. The smaller glass box within the larger solid composition made the interior space a focal point within the façade. Examples on which the glass veil and box are evident are a 1984 Spanish house designed by Jeronimo Junquer and Estanislao Perez and a 1973 American house designed by Ken Roberts and Lace and Arlis Ede, respectively. Slightly different, in the 1990s the small glass box enlarges to match in size the large opaque volume. Void and solid spaces become equal in the design composition as observed in the Mobius House built in 1998 and designed by Ben var Berkel and Caroline Bos. 1) Stephen Zacks, “Vanishing Point,” Metropolis (January 2008): 97. 2) Barry Bergdoll, “‘The Nature of Mies’ Space,” Mies in Berlin, ed. Terence Riley and Barry Bergdoll (New York: Museum of Modern Art, 2001), 99. 3) Zacks, “Vanishing Point,” 97. 4) Peter Carter, Mies van der Rohe at Work (London: Phaidon, 1999), 83. 5) Bergdoll, “‘The Nature of Mies’ Space,” 82. 6) Bergdoll, “‘The Nature of Mies’ Space,” 83. 7) Bergdoll, “‘The Nature of Mies’ Space,” 91. 8) Evidence for the use and the chronological sequence of Seen Scene as a house archetype was developed from the following sources: 1940 Kaufman Desert House  Richard Neutra; Palms Spring, CA in Edie Cohen, "Julius Shulman: Hall of Fame," Interior Design 74, no. 15 (Dec. 2003): S26; PhotoCrd: Julius Shulman / 1950 Walter Prokosh House  Walter Prokosch Architect; Old Greenwich, CT; in John Hancock Callender, "Six East and West Coast Houses," Architectural Record 110, no. 5 (Nov. 1951): 130; PhotoCrd: Joseph Molitor; Vacation House for Thomas Estes Carl Kolch and Associates, Frederick L. Day Jr. Associates; Oyster Harbor, NY; in "Vacation Houses," Architectural Record 118, no. 2 (Aug. 1955): 140; PhotoCrd: Ezra Staller; Catawba Lodge  The Environments Group; Mountain Pines, GA in Edie Cohen, "Splendor in the Leaves," Interior Design 68, no. 1 (Jan. 1997): 117; PhotoCrd: Steve Hall, Hedrich Blessing / 1960 T. H. Mitchell House  Edward J. Siebert Architect; Sarasota, FL; in "An Architect Gives Style to a Budget Builder House," Architectural Record 129, Record Houses of 1961 (May 1961): 63; PhotoCrd: Joseph Molitor; Bruce Porter Arneill House  Bruce P. Ameill; Guilford, CT; in "Architects' Own Houses," Architectural Record 138, no. 3 (Sep. 1965): 183; PhotoCrd: Ezra Stoller Associates / 1970 Bedroom Alcove, Dallas House  Ken Roberts, Architect; Craycroft-Lacy and Arlis Ede, AID, Interior Design; Dallas, TX in Anonymous, "Living Southwest Style," Interior Design 44, no. 5 (May 1973): 155; PhotoCrd: Anonymous / 1980 Round Hill House  Herbert S. Newman; Round Hill, Woodbridge, CT in "Round Hill," Architectural Record, Record Houses 1985 (Mid-Apr. 1985): 126; PhotoCrd: Norman McGrath / 1990 Lawrence Ellison House  Gregg De Meza, Shirley Munoz-Henderson of Seccombe Design Associates and Marla Ushijima of Lundberg Design; Pacific Heights, CA in Edie Cohen, "Pacific Heights," Interior Design 68, no. 12 (Oct. 1997): 138; PhotoCrd: Toshi Yoshimi; Makoto Yamashina House, aka Water and Glass House  Kengo Kuma; Atami City, Japan in Monica Geran, "Optical Allusion," Interior Design 68, no. 10 (Aug. 1997): 120; PhotoCrd: Mitsumasa Fujitsuka / 2000 Small House  Kazujo Sejima and Associates; Tokyo, Japan in "Private Residence," Architectural Record 72, no. 4, Record Houses 2001 (Apr. 2001): 120; PhotoCrd: Shinkenchiku-Sha; Las Arenas Beach House  Artadi Arquitectos; Lima, Peru in Raul Barreneche," Beach House In Las Arenas," Architectural Record 77, no. 4, Record Houses 2006 (Apr. 2006): 86; PhotoCrd: Alexander Kornhuber; Malibu House  Kanner Architects; Malibu, CA in "Twice as Nice," Interior Design 77, no. 3 (Mar. 2006): 207-210; PhotoCrd: John Edward Linden; Lotus House  Kengo Kuma and Associates; Eastern Japan in Naomi Pollock, "Lotus House," Architectural Record 77, no. 4, Record Houses 2006 (Apr. 2006): 103; PhotoCrd: Edmund Sumner/View; Los Angeles House  Nicholas.Budd.Dutton and Kay Kollar Design; Los Angeles, CA in Edie Cohen, "So Cal So Cool," Interior Design 78, no. 12 (Oct. 2007): 296; PhotoCrd: Art Gray. 2) Mendez, Marta. “Theory Studies: Archetypical Practices of Contemporary House Design.” M.A. Thesis, Cornell University, 2008, 98-115.